Description: This two-day intensive hands-on workshop is all about producing music with Maschine 2, the powerful and innovative groovebox system from Native Instruments. We will focus on the very flexible workflows for producing sounds an entire track with Maschine. You will learn to master the routing between Sounds and Groups, side-chaining, best practices for templating and keeping your Maschine files (Projects, Groups, Sounds, and Samples) organized. We’ll also cover Scene-independent looping, setting up and using the Mixer, and much more. During the weekend, you will start with live recording and go through the stages of editing, tweaking, and re-sampling your own sounds to build your own instruments (Sounds/Groups/Projects), sketches or tracks. 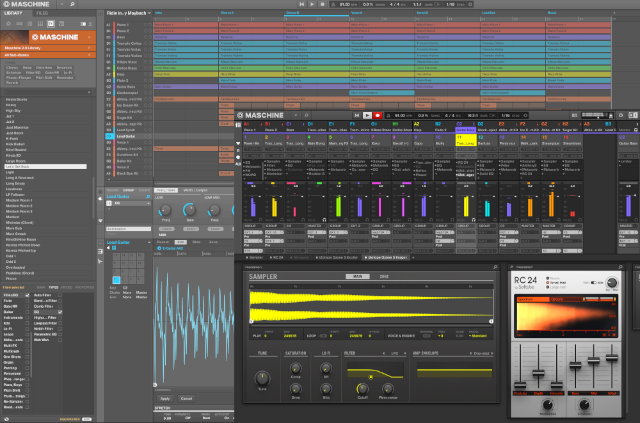 You will also learn to integrate Maschine 2 into a real-world production environment using Ableton Live. The course will walk you through every important feature of Maschine 2 — including Native Instruments Komplete Instruments and Effects integration (also installed on all classroom workstations) — in a real-world production context with a clear focus on learning by doing. You will create your own patterns, kits, and projects from scratch, optimized for both studio and live-performance. You will also learn the ins and outs of using Maschine 2 productively, including using Maschine 2 in Ableton Live as a VST/AU plugin. During the weekend, we will also focus on the particularities of arranging with Maschine 2 — you will learn how to make the Pattern/Group/Scene structure of Maschine 2 work for your own musical styles and needs. You will have your own workstation with Maschine (including controller), NI Komplete, and Ableton Live so that you will have a full range of professional-grade audio tools for creating your sounds. best practices for using external synths: Massive, Reaktor & Co.